For two centuries, from the late 18th century, through two World Wars and into the late 20th century, the Ruhr region of north-eastern Germany was the centre of German coalmining and a hub of European industrial activity. While once it was the engine room of Germany, it is now a centre for reimagining the industrial landscape in the wake of an extended period of economic downturn. The coal-washing facility at Zollverein coalmine, located in Essen, was a standout monument to German industrialisation. Built in the 1920s, the huge facility was one of the most advanced plants in the world. By 1986, however, when German coal was no longer competitive on the global market, the economy of the region went into decline and Zollverein was closed. Over the next few years, the structure became a rusting ruin in the landscape, standing as a memorial to an activity that had once characterised the region, but no longer provided for it. In 2002, work began on turning the former industrial site into a museum; a process that was in step with other projects across the region to promote economic and social renewal through the creation of a cultural economy. The new Ruhr Museum at Zollverein coalmine was opened in time to celebrate the Ruhr region as 2010 European Capital of Culture. German industrialisation pursued through coal, it appears when entering the Ruhr museum, has completed its circle – from once being a functioning coal facility, to now being a site for reflection. Australia’s coal deposits are such that it is now one of the biggest exporters of coal in the world. Australia’s shift to open-cut coalmining in the 1970s was part of a technological transition that occurred across the world and resulted in the centres of coal production relocating away from Europe. Australia has a close connection with, and economic reliance on, the coalmining industry. And yet, coalmining has become one of the most divisive environmental and social issues to face the nation. As the Australian coal industry experiences yet another downturn, it is important to locate opportunities for reflection and debate. Similarly important is finding inventive ways to enhance the cultural capacity of industrial Australia. Museums are locations that offer both potential for reflection and the ability to build a region’s cultural economy. 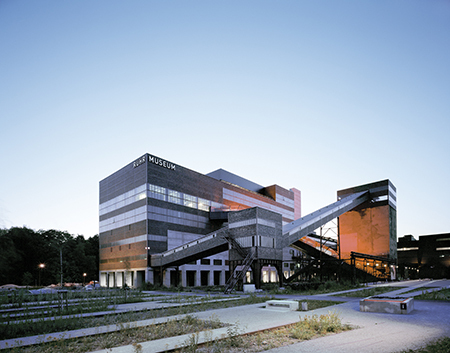 The Coal Global special exhibition, which was on display at Zollverein from 14 April 2013 until 30 March 2014, was an example of how a regional location that was fundamentally changed by the impacts of industry, in this case coalmining, can step beyond its past to trade on an entirely new commodity. The remainder of this commentary explores the Coal Global exhibition, which was displayed in a location that no longer sells coal but, rather, its cultural capacity. By its own description Coal Global was a ‘journey into other people’s coalfields’ that began at Zollverein. The former washing facility is an impressive building and can be regarded as a museum object in itself. The surprise is that this is not an industrial museum, but a regional museum that juxtaposes a number of collections not only under one roof but in almost every room on each of its three display floors. It exhibits the culture of the Ruhr region, the industrial past, and ethnological and natural history. The latter two were the museum’s original collection focus and, prior to the Second World War, when it was located at a different site, it held one of Germany’s largest ethnological and natural history collections. The new collection and the building create an impressive and surprising permanent exhibition. Coal is a global resource. While almost every country consumes coal, and many countries export it, there are no cartels in the coal industry. In Coal Global the intricacies of the coal industry were shown, from machines used by industry throughout the world to images of coal-dust covered workers from all countries. The exhibition showed people, all over the globe, working the earth to extract a resource. At all points the exhibition was about the culture and nature of coal. The exhibition was split into four major sections: global market, coal countries, planet of coal and natural history. There were also a number of subthemes, which were explored in small rooms adjoining the main exhibition space, and included work, living with coal, gigantic machines, protest, trade unions and artistic productions. Coal as a product from the earth was the exhibition’s centrepiece. The majority of the open exhibition hall was devoted to displaying different types of coal from different regions. Specimens from places such as Australia, China, Indonesia, Turkey and the United States were shown not only to indicate geographic diversity but also for temporal surprise: the age of the rocks ranged from three- to 300-million years old. Most of the rocks were displayed on low tables that were positioned approximately 50 centimetres off the ground. While I initially found this height awkward, I came to appreciate the appropriateness of the perspective it imposed as one of looking down into the Earth. In the centre of the room was a projection of the Earth that pinpointed different coalmines across the globe. The projection could be zoomed in to satellite images of particular mine sites, which enabled the rocks displayed throughout the room to be located on Earth. Technology mobilises coal from out of its primeval strata. Coal Global included effective displays of the methods used by less technologically advanced societies to access coal. The coal bicycle from India was a particularly striking exhibit that drew a compelling comparison with, for example, the long coal trains that journey through regional Australia. Coal bicycles often carry 300 kilograms of coal per load and are used in the illegal trade that occurs on the edges of mines in the coal-producing provinces of India. 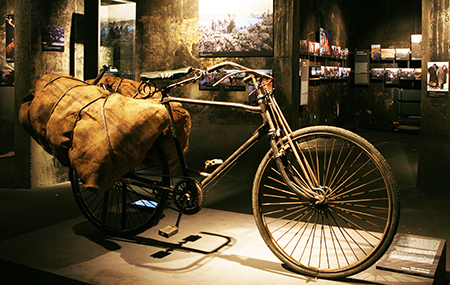 An exhibit such as the bicycle underscored the ubiquity of coal production in contexts that are local, varied and complex. Representations of modern technology are difficult in exhibitions, especially in terms of size. Although Coal Global referred in wall text to the ‘giants of technology’, the objects in the exhibition that represented the technology of a modern coalmine were presented in miniature, including a dragline, scoop, loader, haul truck, blast-hole driller, river barge, continuous miner and a longwall miner. To my disappointment, the exhibition did not include anything of an impressive size, such as one of the enormous truck tyres that move the equally enormous heavy machinery around the mine site. The contemporary urban dweller can have only a limited understanding of the true magnitude of these objects; their size is one of their intrinsic features. Comprehending the size of these machines is important to understanding the local impact of mining and the scale of global trade. Exhibiting large objects is never easy but, in this case, the awe that being in their presence elicits would have contributed to an expression of the global transformation of resources. Germany plans to cease coalmining by 2018. With the scale of production in other countries and the global interconnectedness of the global coal markets, German coal can no longer compete, nor does it have political enthusiasm or subsidies to do so. In the interactive presentation ‘On the road with coal’, it is clear that Western countries with a strong coalmining history – Germany and the United States are two good examples – will, however, continue to have an influence well into the future. The expertise that facilitates the transport of coal around the globe is another significant aspect of the industry and ‘Because of its high level of expertise’, the section panel notes, ‘Germany will remain a coal country even after mining comes to an end in 2018. German geologists continue to help in the search for new coal fields and in extinguishing coal fires underground’. An exhibition on coal is also an exhibition about people. Coal Global evocatively captures the experience of living and working in the vicinity of coalmines through extensive use of photographs. The Ruhr Museum has a specific collection focus on images; of the approximately six million objects in their collection, about two million are photographs. Those photographs displayed in the exhibition created empathy and immersed me in personal experiences. Their impact was strengthened when viewed in conjunction with a series of unique and surprising objects including a blade of grass from Poland that miners took down into the pit for luck, the pigeon-racing trophy won by miners in the Ruhr (which is home to one-third of all pigeon racers in Germany), or the silicosis-affected miner’s lung. There are many local and global impacts from extensive mining. The local impacts, from destruction of agricultural land to changing local ecosystems, are captured extensively and effectively with creative objects. For example a packet of Wrigley’s gum was displayed to represent the loss of mint farms in the United States, which provide the flavor for the gum, that are losing land to coal infrastructure. Another, more poignant, example is that of the Humboldt penguin in Chile, which is suffering a population decline from the ecological changes wrought by coal-fired power stations. The global impact of coalmining and coal burning, in particular the contribution of carbon dioxide emissions from extensive burning of coal and its subsequent impact on climate change, is mentioned in wall text a number of times, but it was rarely displayed with the creative excellence that was on display in the rest of the exhibition. In an area such as Zollverein, and Germany as a whole, where a transition to cleaner forms of energy production is occurring, it was surprising that climate change was not presented as an opportunity. As an institution that takes its starting point as the culture of the Ruhr region, the profound connection to coal remains strong and it appears that climate change might be a difficult topic to exhibit. This omission probably tells more than any object about the long-term impact upon cultural identity of industrial regions and the strong connections to mining – it hangs around in the psyche. Displays that evoke tension within a single theme are the bread and butter of the Ruhr Museum. It is done so well in the permanent exhibition and in Coal Global, I started to think that this type of museology must be easy. But it requires real vision on behalf of the curators and designers. This is most visible in one of the smaller side rooms of the exhibition, where the mural The True Cost of Coal (2010) by the Beehive Collective, a US-based public art and civic dialogue activist group, is juxtaposed with coal company advertisements, videos and websites. It is unsettling to look at the mural in all its detail while listening to the voiceover from a promotional video by Peabody mining company. There is no statement of whether coal is good or bad, just the present state of gridlock between protest and promotion. At the end of the exhibition space I arrived at the natural history of coal. There was a presentation on how coal is pressed from a pile of forest litter into a small rock of compressed energy. And there were two small rooms dedicated to coal as a fossil rock, displaying coal layers imprinted with leaf patterns from primeval forests. My journey in this exhibition began with the global coal market, moved through coal samples from deep within the earth, explored various technologies, meandered through side rooms full of work and culture and, finally, addressed the natural history of coal. I had walked back in time – from the market to the ancient forest. This conceptualisation was ultimately a creative approach to presenting coal. It worked in a non-confronting way, and allowed me to expand my understanding of coal across deep time and global similarities into local contexts, while all the time keeping one rock as the focus. The exhibition could be seen in tension. Looking deep into the fossil rocks demanded that I reflect on coal: a rock obtained using many different machines but created over millions of years of earth processes. Hidden deep on the bottom floor of Zollverein, a former coal-washing facility and now a museum, I got to thinking about the ethnographic natural histories of the sort that the German philosopher and critic Walter Benjamin has inspired. In that room full of fossil rocks I couldn’t help but think of Benjamin’s brief essay ‘Excavation and memory’, in which he wrote, ‘He who seeks to approach his own buried past must conduct himself like a man digging’. The value of museums, as evidenced at Zollverein, is that not only do they build capacity within a region, they offer an excellent place to reflect on our histories. Deep reflection can be inspired in museums. If done well, museum exhibits offer a way to look at our complex pasts and possible futures in an informal and comfortable setting. A good exhibition can get at the tactility of an object and, in the same space, it can outline the debates surrounding a commodity. This German exhibition can be seen as an example for Australia – a country that has witnessed the environmental ravages of coalmining and which is unsure how to take the next steps in addressing possible energy futures. 1 I would like to thank the German Cultural Foundation (Kulturstiftung des Bundes) for support through the FellowMe program which gave me the opportunity to travel to Zollverien.